William Garden, the naval architect and marine engineer, is a romantic, a traditionalist, a perfectionist. He&apos;s a man who cherishes privacy and does not suffer fools. A skilled shipwright who learned to sail and build boats before he began designing them seven decades ago, Garden loves schooners built of oak and cedar and motor boats whose engines go pockety-pockety-pock and leave barely a ripple as they pass. So here we are, in a 42-foot fiberglass trawler that leaves a fair wake, needs two engines to get up to speed-and we&apos;re botching a landing at his private dock on the tiny British Columbia island where he has worked and lived for more than 30 years. Bill Garden, a consummate sailor since he was a youth, an icon among naval architects and a legend to those who own his boats, is standing on the float watching what seemed like amateur hour. I first approached Garden by telephone nearly a year ago, asking for an interview. He declined politely, explaining he did not want to be involved in a magazine project. PMM had published articles about Art DeFever and Ed Monk, two contemporaries equal in stature, and believed Garden should be next, I explained. He demurred. "I am obsolete," he said. Although he did not want to be involved in long interviews for a magazine article, Garden did invite us to drop in for a visit. It was a sincere gesture, but I later learned he believed I lived on the East Coast and not within a day&apos;s cruising at eight knots. The invitation was genuine, but he probably believed there was little chance I really would show up on his doorstep. So it may have been a surprise to him last July when we called to say we were in the neighborhood. The next day we turned our 42- footer into the narrow pass leading toward his island, dodged kelp and rocks and spotted Garden&apos;s float with a 29-foot schooner and a 95- year-old, 25-foot motor launch lying alongside. We used a cellular telephone to warn him we were minutes away, and he warned us the current was setting south. Indeed. It was jetting south, nearly parallel to the float. We turned into it, but a bit of the current appeared to be bouncing off the rocky shore on the opposite side of the float, making a challenge of coming alongside. As we closed on the float and struggled to close the final three feet smartly, Garden took lines and helped make us fast. Later, he told me the best way to make that kind of landing was to power up and bring her alongside. A short, slender man with a bristly mustache and graying hair, Garden led us along the float. We stopped at Toadstool, the schooner he designed and built on the island 25 years ago, and which he says goes down wind like smoke. Then we admired Merlin, a powerboat he rescued from a back yard more than 40 years ago, restored and continues to use as a shoreboat. We turned onto a long ramp leading from the float across the beach and walked up onto the rocky shore of the small island. In his writing on design, Garden acknowledges ownership of the island, but never has published its name or precise location. So I am not going to offer any more than he does, which is to say that the island is near Sidney, which is on the east shore of Vancouver Island in British Columbia. He calls it Toad&apos;s Landing, but that name won&apos;t be found on a chart. We were not trying to be Mike Wallace and 20/20 on that visit. Because of unspoken ground rules that we would not be rudely nosy, we asked only a few general questions that did not probe deeply. Garden was gracious and helpful, but taciturn. Although Bill Garden loves wood, tradition, and simplicity, he has turned out some of the most unusual, challenging, and downright smashing contemporary yachts in wood, fiberglass, steel, and aluminum. He was among the first to design comfortable, always-in-style, trawler-type boats for family cruising. His name has been signed on plans for more than 1,000 yachts (power and sail), fishing boats, ferries, patrol vessels, and even barges, over 60 years of creative work. An estimated 6,000 Garden vessels have been built by yards in the U.S. and overseas. Garden has drawn heavy cruising yachts that plod along gently at eight or nine knots. Trawler-type boats Garden designed in the 1940s and 1950s were among the first of their kind built and they remain contemporary today. He has drawn the lines for an adventurous fleet of long and skinny yachts for daring and trusting clients that top 20 knots efficiently without much regard for the weather. Sailing ships of 140 feet, a modern and classy motor yacht of 161 feet, heavy ocean motor yachts, rowing boats, a paddlewheel boat, even a boat-shaped cradle, all have flowed from Garden&apos;s mind to the drawing board and into the water (except, of course, for the cradle). But Garden is a private man who rates his interest in social activities at near zero, and who declined to have any part of this effort to recognize the work he has done over seven decades. Now in his early 80s, Garden is retired, but keeps a hand in the business by looking after several projects from his hideaway homeoffice- shop. When he bought the two-acre island more than 30 years ago, the only structure was an old fishing shack. After some improvements, Garden moved his naval architecture business to the island and began working there. It involved a daily commute, usually in interesting small boats, from the shore of Vancouver Island. Later, after more improvements and additions, he moved his home there. Today the shingled house sprawls across the rock of the island, with every room offering views of trees and the water. It is built like a classic yacht, of stout timbers carefully pieced together and with an abundance of nicely finished wood trim. The house is surrounded by pleasant English cottage gardens (the topsoil for the gardens came to the island in bags aboard Merlin). A rowing boat is suspended from the ceiling in the office area of the house. Too large for one room, the boat pierces a wall and appears in the next. Up the hill a little is the Garden shop. A small sailboat awaiting restoration was the only vessel in the building that summer day we were there. In the past, the shop buzzed with busy shipwrights, including Garden, at work building boats. The saws, planers, lathes and other tools are all belt-driven from a central engine. In one room, we stopped to look at an aging single-cylinder Volvo diesel engine and other marine equipment. Out behind is a marine way used to slide finished boats into the sea at high water. Nearby, overlooking the water, is a planked helicopter landing platform used by busy clients for whom Garden designed multi-million-dollar sailing and power yachts, some of which would carry choppers aboard. Weeds growing between the boards indicate it had not been used recently. We walked around the island, noting carefully-built stone walls, and stood looking down onto the channel separating his island from the next. The tide was low and the clean, shallow water looked inviting. Migrating ducks gather in the channel in the late winter and spring and are rewarded with a handout. The island has power and water connections with the mainland. Garden was born in Canada in 1918. The family moved to the U.S. when he was a youngster, reaching Seattle in 1928. With great sailing waters at the city&apos;s front door and world-class shipyards on the waterfront, it didn&apos;t take long for Garden to get involved. Norm Blanchard, of one of the city&apos;s famous boat-building families, knew Garden in those early days. The young Canadian was one "of the real sailing kids" in the city, Blanchard said in his recently-published autobiography, Knee- Deep in Shavings, published by Horsdal & Schubart of Victoria, B.C. Garden learned the art of boat building in the city&apos;s yards and in a vocational school, and soon linked up with Dave LeClercq to open a boatrepair business on Seattle&apos;s Lake Union. They rented shop space for $5 a month, LeClercq remembered. The pair later split because of Garden&apos;s increased interest in design and LeClercq&apos;s need to make a living building boats. LeClercq founded Commercial Marine Construction Co. on the Westlake Avenue-side of Lake Union. His yard built hundreds of fishing and work boats over several decades, many of them designed by Garden. They remain close friends. LeClercq and his son, Sam, who now builds luxury yachts in Seattle, occasionally head north to visit Garden. They travel in Sam&apos;s boat, the Garden-designed Mollie, a 73-foot by 15-foot speedster powered by twin 1,000 horsepower MAN diesels with Arneson drives. It cruises comfortably at 32 knots and will top out at 40. Dave LeClercq, who now lives in a house built on the site of the old Grandy shipyard on Lake Union, remembers they met while Dave was building a 26-foot sailboat designed by Seattle&apos;s Ed Monk, and Garden was working on a schooner he had designed. "He was a cracker jack," Dave recalled. "You should see him with an adze." Boat-building techniques Garden learned in class and from journeymen he shared with LeClercq. "He was my best teacher," Dave said. Laurie Armstrong, a Victoria, B.C., attorney who represents Garden and is a long-time friend, has personally built several Gardendesigned boats. Armstrong now is building a 42-foot powerboat designed by Garden, and he affirms the architect&apos;s demand for perfection. "He&apos;s taught me everything from how to sharpen a chisel to building a boat," Armstrong said. Garden dropped by the construction shop early one Saturday morning to check on progress, Armstrong recalled. "I had the transom built and framed, and he walked in and grabbed a tape measure and a plumb bob." As he entered the shop from 40 feet away Garden saw that the transom was out of alignment. Measurement proved that. "He made me tear it out and start over," Armstrong said. "He has the most amazing eye." Armstrong said that a person who individually begins to build a boat must be obsessed. "But you&apos;ll find that a lot of people who built one of Bill&apos;s boats build a lot of them." Among others Garden keeps an eye on is John West, a Victoria businessman and a friend for 30 years. "I grew up on the coast, and he was one of my heroes," West recalled. "I sent for his catalogs and had his pictures on my bedroom wall." West, who has owned two Garden-designed boats, affirmed the sharpness of the architect&apos;s eye. West was restoring a sailboat Garden had designed years before. "Bill would come down every Saturday morning about 7:30 or 8 o&apos;clock to check on things," West said. "It was out of his way to work by about 10 miles." Nearing completion, West painted the bulwarks gray. Then Garden arrived. "There was no &apos;Good morning.&apos; He just said &apos;Get that gray off, she doesn&apos;t have the freeboard for it.&apos; I had already come to that conclusion." People who proved themselves to Garden by doing good work generally were accepted. "But he would tear strips off people who did bad work," West said. "He doesn&apos;t suffer fools at all." Another time, West was stripping paint from the hull on yet another Garden boat he had purchased. "Bill Garden stopped and lowered the window on his old Cadillac and said, &apos;It&apos;s a hell of a lot of work being a romantic, isn&apos;t it?&apos;"
Greg Marshall, who began working for Garden while a high school student, said the architect slowed his professional life as he moved to Victoria. Business had been hectic in Seattle. Garden moved from his first Seattle office in an old sawmill to several other office sites, and his staff expanded with the popularity of his work over decades in Seattle. Marshall, now a naval architect in Victoria, said Garden began to reduce the scale of his business when he returned to Canada, although he still took on big projects. "In Seattle he was busier than he wanted to be, while in Victoria he could pick the projects he wanted," Marshall recalled. To control his professional life, Garden would often not return phone calls or letters from persons who wanted him to design a boat, but whom Garden judged not really serious. This, Garden noted dryly, saved a lot on postage. "He was a very honest person, and with his depth of expertise he would often tell people not to build a boat, but to buy a production boat," Marshall said. "He is in a unique position. Financially, he doesn&apos;t need to work; he can afford to be independent." Is he really a perfectionist? "Yes, very much so," Marshall said without hesitation. "He is just a remarkable man, he is an interesting person, and he is extra keen on a wide variety of things. "He began as a shipwright in Seattle and that is unusual. If a shipyard has a question, he can pick up a tool and show them what he needs. Not one in a thousand can do that." "Bill has a distinctive sense of design," said Jay Benford, a Maryland naval architect who also runs a marine publishing business, Tiller Publishing. "It is one that combines artistic presence with practical design. His boats are so good looking and functional." Garden has been a pace setter, said Benford, who recently revised and re-issued Garden&apos;s book on boat design. "He has created styles that have become popular because they were appealing, and because they worked. "Bill has been a wonderful influence on a lot of people in this business." An Ohio couple, Bill and Joey Hall bought Joey, a 42-foot Garden trawler originally named Kingfisher. They weren&apos;t looking for a Garden boat, but a broker in Florida steered them toward a yacht then called Fjord. It was love at first sight for the Halls. With the Garden name on the boat, Bill Hall said he was confident she was a good vessel. "The Portuguese bridge was also a plus, because it is a great place from which to steer and watch the world go by, and the overhang provides shade most of the time. "This boat was built with heavy fiberglassing over a strip-planked plug. The plug was left in the boat, providing the warmth of wood in the forecastle." The Halls bought the boat in Fort Lauderdale and spent several months taking her home to Lake Erie. Along the way, they stopped at Washburn&apos;s Boat Yard in Solomons, Maryland, to have paravane stabilizers added to reduce the rolling common to round-bottom boats. "Shortly after we bought the then-Fjord, I wrote a letter to Mr. Garden expressing my admiration for his creations over his career. The letter he sent back, in pencil in his own handwriting, is something I value highly. "Unfortunately, as I was trying to design an alternate interior layout a few years later I again wrote to him asking him for help. "He wrote back explaining very nicely that he did the best he could when he designed her, but if I came up with something he would be glad to draw it up for me. "I felt like I had insulted God!" Garden himself was obviously pleased with the boat. It is featured in his latest volume on yacht designs. She&apos;s hefty, displacing 57,000 pounds. She has a beam of 14&apos; 6" and draws 5&apos; 3". The pilothouse is raised and well aft. 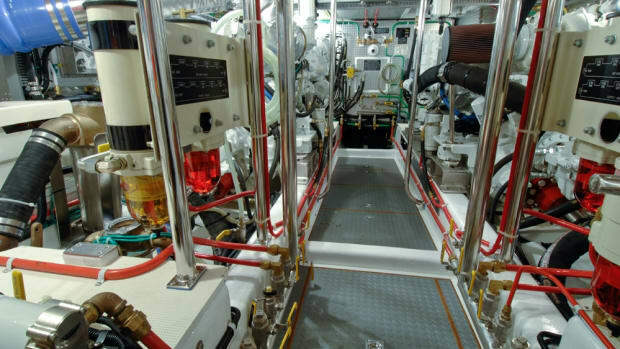 The saloon and sleeping areas are all below the level of the main deck. Included with the discussion of the yacht&apos;s construction and line drawings is one of the little sketches for which Garden also is famous. It offers a more casual look at the boat under way, with a cartoon-type figure leaning on the cockpit railing. These little line figures often pop up in Garden design drawings. Some carry paint brushes, others may puff on a pipe. They add a friendly, whimsical touch to his work. Garden was firmly in business by the late 1930s. In his book, Blanchard wrote that his ship yard in 1938 "built a nice Bill Garden sloop, about 45 feet long, called Arguella." In 1939, Garden launched Gleam, a 30-foot schooner he designed and built for his personal use. "The old account book shows a total expenditure in time of 1,621 hours and the material cost was a grand total of $700, including a rebuilt Kermath 8 hp, two-cylinder engine," Garden would later recall. "Not much money by today&apos;s shrinking-dollar standards, but then it was the residue after living expenses from the previous year&apos;s boat building at 80 cents per hour." By the time he entered military service in World War II and was forced to lay up Gleam, Garden had designed or helped build about 50 boats. After the war, he became a licensed naval architect and marine engineer and opened the sawmill office on Lake Union, where he designed and built Rain Bird, a 40-foot schooner, for himself, while working for clients at night. Rain Bird was followed by Oceanus, a 60-foot sloop with a 12-foot beam, which Garden sailed personally for many years. She was "designed for optimum performance under sail or power," Garden wrote after she was launched in the mid-1950s. Finally, in the 1970s, after he moved his design practice to Vancouver Island, Garden designed and built Toadstool for his personal use. Despite his love for sail, Garden turned out a large fleet of power yachts and hundreds of work and fishing boats. Many were one-off, custom boats. Some designs had miniproduction runs, with perhaps four to six built. One of his most popular production boats was the 36-foot Vega, a yacht originally built in fiberglass for a California boater, Ramsey Armstrong. Powered by a four-cylinder diesel engine, the double-ended Vega had accommodations for six persons and a range of 1,600 miles at eight knots. Armstrong formed a corporation to produce and sell the boat, with Willard Boat Works of Costa Mesa, California, the builder. About 100 were built. Working for scores of clients, Garden designed full displacement eight-knot boats, some of which resembled Northwest fishing boats. He drew lines for 10-knot diesel cruisers, as well as 20-knot yachts for clients in a hurry. One popular line was based on Wanderer, a 42-foot, single diesel, flybridge cruiser first introduced in the 1950s. She had covered side decks and a cover over the aft cabin. "The Wanderer model was one of the early shipshape-appearing double cabin motor yachts developed for Northwest cruising," Garden wrote. "Power then was usually a war surplus GM 6-71 diesel, while many of the later ones had Cat or Cummins engines." Heavily built with oak framing, yellow cedar planking, fir stringers and beams and a glasscovered superstructure, Wanderer&apos;s timeless design proves Garden was a visionary when he drew the plans a half-century ago. Thousands of boats much like her have been built by many yards since. Another production yacht was Snow Goose, a 41-footer that would turn 8.3 knots with a pair of Perkins 6-354 engines at work in the bilge. First built in 1963, she is a flybridge yacht with covered decks and two staterooms forward, each with a head. Covered decks were a luxury in those days, "a shippy feature we can&apos;t afford on such a small cruiser; however, it has great visual appeal for the sailor and affords excellent security when working alongside floats and docks. Even though big freeing ports are fitted, I wouldn&apos;t want to take a boat with this much well-deck around Cape Horn, yet it is quite practical for summer coastal yachting," Garden wrote in one of his design books. Four were built the first year by Howard Roberts in LaConner, Washington. "Since they first came out, it seems that about half of the Northwest&apos;s diesel cruisers built since are look-alikes, which is a sincere form of flattery but doesn&apos;t do much for the stew pot," Garden wrote. Two classic Garden-designed yachts were on the market in Seattle recently, so I took a look. First was a 1972 43-foot tri-cabin trawler built in Victoria, B.C., of cedar and oak. A generous beam of 14 feet 6 inches allows side decks and roomy interior spaces. Two things were impressive: the curves molded into the after sections of the deck house and the immense saloon. This boat has beautiful paint and the woodwork was flawless at 27 years, despite the difficulty of shaping wood with such curving lines. The teak-paneled saloon is about 10 feet wide and 15 feet long. Large windows provide excellent visibility all-around from the helm on the starboard side. The U-shaped galley is aft on the port side of the saloon and there are settees on both sides. Garden occasionally exposes structural members and on this boat the knees supporting the ceiling offered convenient handholds for rough water conditions. Forward are V berths, a head, and an entrance to the engine room and its GM 8V-71 diesel. Today&apos;s boat buyers probably would rate the after stateroom a disaster. It has a double berth to port and a single to starboard. Klunky baseboard heaters are everywhere and it was obvious someone had slopped on a coat of paint to improve its looks. However, a little work and cash would make it into a nice cruiser. Impressions: This is an older boat with still contemporary lines. If her wood and machinery are okay, this is a fair buy at something less than the asking price of $125,000. Farther along the shore, I found one of my favorites: a 64-foot raised pilothouse yacht built by Vic Franck of Seattle in 1967. She&apos;s a wood boat (yellow cedar and oak) and was in the Franck yard for some repairs needed as a condition of sale. Garden said a small fleet of boats like this were built. It&apos;s easy to see why. There&apos;s a Portuguese bridge forward, a raised pilothouse, covered side decks and cockpit. Twin diesels power the boat. Dan Franck, Vic&apos;s son, showed me the boat and pointed out some cosmetic and structural changes made by successive owners. The most dramatic was elimination of a small crew cabin forward and creation of larger master stateroom and an over-done master head. Wallpaper covered wood paneling Garden specified, but the cane mesh inserts in cabinet doors (for ventilation) had not been touched. "Bill&apos;s concern was for ventilation," Dan explained. "To keep the boat sweet." The pilothouse is original, down to air swipes on the windows and exposed knees that support the ceiling. This is a ship&apos;s bridge, with good visibility. The saloon is large enough for a dock party and the U-shaped galley, with standard-sized appliances, is capable of serving all who come. This one is a classic Pacific Northwest boat and many much like it were designed and built by others later-Ocean Alexander, DeFever, Grand Banks, to name some of the best. The asking price was $350,000. Boats virtually identical to this 1967 model are still being built today, proving just how obsolete Bill Garden is. Garden favors efficiency and performance. Over the years, he built fast, handsome motor yachts that would crack the displacement speed rule. Some purred along at 12 to 15 knots, while others would top 40. His fast boats are usually skinny. In 1969, he designed and built Claymore, a 70-foot express cruiser with a beam of only 12 feet. Powered by two Cummins V8 370-model turbocharged diesels, Claymore cruises comfortably at 25 knots. She has an open transom with space in the cockpit to haul a dinghy aboard. "Claymore was designed for running performance that combined high speed and seagoing ability with simple accommodations," Garden wrote in one of his books. "A boat of this sort is a revelation to the average boatman, who is used to the pushwater characteristics of the usually fat-bowed, overloaded cruiser. "Claymore slides along at close to one nautical mile per hour for each 100 revolutions...the usual speed is now 2,000 revolutions for a pleasant, economical 20 knots," Garden said. 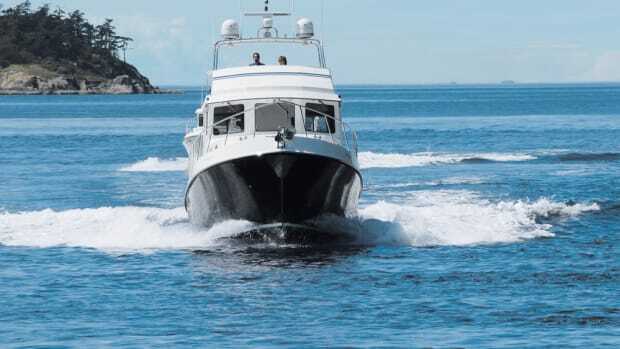 "With this speed and weatherliness,Claymore&apos;s cruising range during a holiday will cover an impressive amount of coastline. She&apos;s gone around Vancouver Island in an easy four days elapsed time and little over one day&apos;s continuous running time. Summer sea conditions can be taken as they come, but until a person experiences the seagoing qualities of such a boat, any discussion of them is just conversation." More radical is Captain Teach, an 80-footer with an 11-foot beam designed in 1972. Powered by a single Cummins 903 diesel, she speeds along at 12.5 knots. She is an enlarged version of another boat, Tlingit, a 62-footer with a beam of seven feet, six inches, which does 10.2 knots with an antique three-cylinder Easthope engine cranking out 30 horsepower. Did Garden go too far with skinny-and-fast boats? Not at all, says his friend Orin Edson, the Bayliner founder. "These boats were for someone who wanted efficient, easy-riding boats, who wanted performance more than space," Edson said. "The rules still apply: long and skinny boats work better than do fat, stubby ones." Marshall, the Victoria naval architect who worked for Garden for eight years, starting as a draftsman, said: "The long, skinny boats are definitely more efficient, but they are a tough sell on the market because people don&apos;t understand them. They run and look better, but people want the maximum volume for length." As far as Garden was concerned, the more efficient the boat is, the better it is, Marshall said. "He hates pushwaters." In the 1970s Garden designed a 67-foot by 15- foot express cruiser for Edson, then chair of Bayliner. "They are an interesting study in the maximum-performance-for-a-given-power approach, as opposed to getting the most accommodations in a given length," Garden wrote about the Bayliner Express yachts in Yacht Designs II, another volume on his work. The latter view, he added, leads to the "sluggish three-story floating condo models so prevalent in today&apos;s yacht market." Performance and accommodations in a motor yacht always have been in conflict. He said the more common semi-square yacht model&apos;s proportions allow the most practical and economical use of space-hence its logical selection for all-around sheltered cruising. "At the marina, the three-story look fits right in, but long, lean and elegant will perform." The Bayliner Express yachts "have proven to be excellent sea boats with rough water performance unmatched in most stock motor cruisers," he said. Obviously, a boat 70-plus feet long with only 15 feet of beam is limited in living accommodations. Bayliner never offered the boat to the market. "It was not commercially acceptable," Edson said. Jack Hughes, a member of the Bayliner board, built another from the Bayliner Express design, Katherine II. (Garden would later design another boat for Hughes, the 92-foot Katherine III, a 28- knot vessel powered by twin 1,350 horsepower GM diesels.) And Sam LeClercq has Mollie, whose superstructure is of swept Euro styling. The megayacht Garden designed for his friend Edson is considered a masterpiece. Evviva draws admiring glances wherever she is because she represents a careful compromise between skinny-is-good and the need for living space, and is a fast, efficient yacht. "Bill makes them run so nice. We once took Evviva to San Diego in 60 hours, we averaged 23 knots," Edson said. 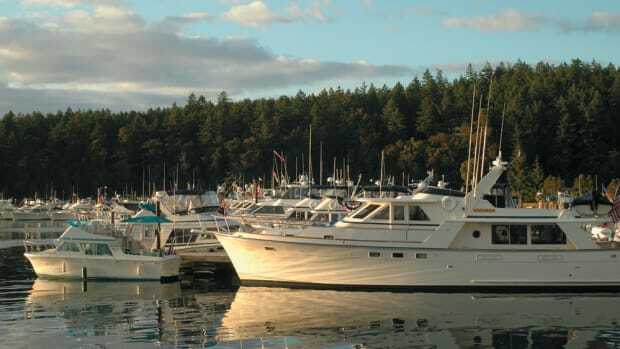 Edson and Garden met in the 1960s when the owner of Bayliner sold the architect a 17-foot stern drive boat for use as a shore boat on an island he owned in Barkley Sound, on the west coast of Vancouver Island. "We became good friends because we loved boats," Edson said. Garden&apos;s boats are popular "because they are really salty, really boaty-looking boats. Once you get used to Bill&apos;s boats, you can tell them miles away," Edson said. As good as his designs are, Garden "is not a great interior man," Edson said. "Gray paint is just right for him." Garden also designed the 30- and 32-foot Buccaneer sailing boats for Bayliner. The production run was brief. Edson helped encourage Garden to build with fiberglass. Although Garden loved wood for boat building, he also worried about cutting trees. He has planted groves of oak trees on his island. "The petrochemically-based boats don&apos;t seem to be as much a ripoff of the dear old earth&apos;s mantle as does a warehouse full of tree bodies," Garden said. "For any tree we cut on Toad&apos;s Landing, we put in 1-1/2 young trees." Two years ago, Seattle businessman Dennis Nachtweih and the people at Philbrook&apos;s Shipyard at Sidney, where many Garden boats have been built, planned the first Garden Party on Vancouver Island. Several dozen owners brought their boats. It was deemed a success and a 1999 Garden Party was scheduled and proved equally successful. Nachtweih owns a Garden-designed 58-foot twin-diesel planing cruiser built in 1970. Originally named Ding Ho, she has been renamed Perfetto. About 30 similar express cruisers, capable of 18 knots or so, were built. They are cold-molded, with a double cedar skin over sawn frames and bulkheads. Perfetto has been repowered with a pair of Cummins 400 series diesels. Much lighter than the original V8 diesels, the new engines increase her speed by three knots. It was a coincidence that he bought a Garden boat. "I just loved its lines." Nachtweih said the huge variety of Garden designs prompted him to plan the Garden Party. "You go to a rendezvous for Bayliner or Tollycraft and you walk around and say, "Hey, you&apos;ve got blue carpet, I&apos;ve got green. "With Garden boats you can go on all day because he has done everything from baby cradles to 170-footers. You can walk the dock and see similarities, but they all are different. "I dreamed about doing this for ten years." Everyone worried about whether Garden would come. He said he would not. West, the Victoria businessman and 30-year Garden friend, said Garden has been asked to be an honorary marshal for an annual show of classic wooden boats in the waterfront city. He always refuses, West said. But he often comes down to the docks in the morning, before the crowds appear, to have coffee and to talk with boat owners. Garden Party planners were worried. But Garden pleased everyone and attended the first two parties. There will be a third party later this year, probably in June. And sponsors again have their fingers crossed. So, this is Bill Garden: gracious host, friend to many, perfectionist, witty writer, industry icon, a romantic, a traditionalist who designs exciting new yachts, a man who loves boats and his privacy. Is he obsolete? Looking around the Pacific Northwest boating scene makes it hard to buy Garden&apos;s pessimistic self appraisal. "He created the trawler design 20 years ahead of its time," said his Victoria friend, Laurie Armstrong. "Boats he built in the 1950s are still contemporary. "You can&apos;t pigeonhole him. You look at the range of boats he&apos;s done and it is amazing. The thread is under water. The lines are so easy and so good through the water. Anything Bill designs sails and moves so well." He may be that, if a measure of a naval architect&apos;s success is the design of yachts that look like sneakers on the swoosh or three-story floating condos. He may be outdated in his belief that yachts should move effortlessly through the sea, thanks to good design, and not push mountains of water. He may be obsolete because he believes the best boats often are the simplest boats. "If he thinks he&apos;s obsolete," a friend said, "he should just get back to work." On the balmy weekend of June 26/27, with a flower-scented breeze wafting across the water, a maritime version of a "Garden Party" was held at Port of Sidney near Victoria, B.C. This was the second annual rendezvous of boats designed by master naval architect William Garden, who lives nearby. The event was once again organized by Dennis Nachtweih of Seattle, following the success of the first rendezvous in June 1998, which was held with the support of Philbrook&apos;s Boatyard in Sidney, where many Garden designs have been built over the past four decades. From luxury yachts to gaff-rigged schooners to local runabouts, one thing common to Garden&apos;s boats is the loyalty they inspire in their owners, who, in many cases, have spent years imagining, building, or searching the continents for the boat of their dreams. Garden was among the first naval architects in the Pacific Northwest to adapt commercial designs for pleasure use, and the Port of Sidney docks were graced with examples of his work. Bill Trenholme&apos;s lovely 58-1/2-foot Sayonara is based on the lines of a halibut fishboat, 80 tons of comfort and seaworthiness which he takes sportfishing offshore year-round. "Each boat is developed around an owner&apos;s needs and ideas of aesthetics," explained Garden, in his book Yacht Designs. "Bill Trenholme&apos;s early background was in tugs, so the theme is on the rugged side." Construction on Sayonara began in 1974; she was launched six years later after 23,000 hours of labor; 7,000 hours by Trenholme and the other 16,000 hours by high school students he trained during the project. "Apart from modifying the cabin to make it bigger, and replacing the fish hold aft with a stateroom, the boat is true to its origins," says Bill. The hull is planked with 1-3/4" fir on oak frames, with a three-foot-wide band of gumwood sheathing along the waterline. There are ten tons of gumwood in the boat, including the caprail, shoe, stem, sternpost, horn and ring timbers, and engine beds. 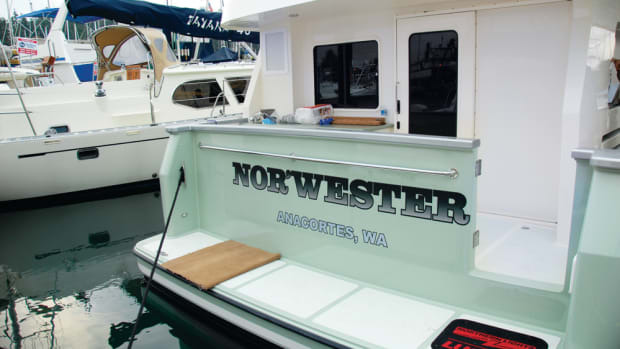 Added to the 17 tons of lead ballast and four tons of engine, this does make for a rugged vessel, well suited to Bill&apos;s passion for chasing big halibut and chinook. Trenholme manages just fine without a bowthruster on Sayonara, and although he carries paravane stabilizers, he finds them a bit of a nuisance, preferring to "batten things down and roll." Coming around Cape Cook this past summer, one of the most challenging passages on British Columbia&apos;s rugged coast, Sayonara rode easily through a 45-knot gale. Bill has put 6,000 hours on the single diesel engine, which had already had 20,000 from a previous boat. It is a coveted English Gardner eight-cylinder diesel, and it drives Sayonara at 8-3/4 knots using three gallons per hour. Apart from being modernized to include a hydraulic transmission and thermostaticallycontrolled engine cooling, the 12-foot-long engine runs as quietly and efficiently as the day it was built. (Bill fired it up at the dock to demonstrate its thoroughly impressive lack of vibration, balancing a dollar coin on edge atop one of the cylinder heads! Sayonara&apos;s interior feels snug, yet substantial, warmly finished in solid teak with rounded corners, lots of cushions, handholds and custom-made hardware, not to mention the oil-fired furnace and big Dickinson oil range. The galley is tucked between the main saloon and wheelhouse, which can be closed off; below decks are two complete staterooms, including the owner&apos;s cabin aft with a built-in table and settee. In striking contrast to Sayonara is the 70- foot, wood-hulled Claymore, displacing a mere 26,000 pounds. Garden has become renowned for his trademark, sharply-angled bows on high performance powerboats such as Claymore, which he describes as "designed for running performance that combined high speed and seagoing ability with simple accommodations." Claymore cruises at 20 knots with twin 320 hp Caterpillar diesels, and has been taken to Alaska and around Vancouver Island. Dozens of Garden&apos;s diesel express cruisers were built in past decades, one example being the 58-foot Perfetto (ex-Ding Ho), launched from Philbrook&apos;s in 1970 and now owned by Nachtweih. Perfetto has a doubleplanked, semi-displacement hull with a 3-1/2- foot draft. Powered by twin Cummins C-400s, she cruises easily at 12 knots with a top speed of 19 knots. Garden recommends large rudders: "Good, big rudders assure positive control on one engine or when running slowly before a bad sea," he comments in Yacht Designs. "The little, inexpensive pie plates under most boats work fine at speed, but a real pair of blades will make most operations a vast improvement." There were several tri-cabin trawler yachts at the rendezvous, such as the 42-foot Cahlita and the 42-foot Wanderer class Silver Fox. Trenholme previously owned a Wanderer class trawler, a design Garden perfected in the 1950s; the majority of these boats were outfitted with GM-671 diesels, probably the most popular engine on the West Coast. The 60-foot Capella is a full displacement vessel with a traditionally-built wood hull and a single 185 hp Caterpillar diesel. Capella&apos;s layout is ideally suited for entertaining; the bright, airy main saloon opens on to a generously-sized cockpit with upholstered seats. Wide steps lead up to the wheelhouse, with three staterooms forward. Now owned by Seattle businessman Peter Bradfield, Capella was originally built for Boeing&apos;s daughter and her husband, and carried a full crew, including a chef. The 46-foot double-ended Puffin, built by Jensen in 1966, is similar in style to a Romsdahl trawler and gives the impression of being as compact a package of seaworthiness that you could find. Owner Lyle Petke, a marine pilot based out of Tacoma, Washington, had his eye on Puffin for six years before she came up for sale. Even then, he took three days to complete the survey-but he knew what he was buying and was willing to put in hundreds of hours of refurbishing and repair. He&apos;s built yellow cedar cabinets and laid a new fir sole in the main cabin (it&apos;s nice to see the use of local woods), replaced rot in the bulwarks, and scraped layers of grease out of the engine room-which now smells so sweetly that his wife Linda can hang her towels up to dry. Puffin&apos;s main saloon, galley and steering station are on one level, with stairs on the port side leading down to the head and staterooms: four bunks in the fo&apos;c&apos;sle and the owner&apos;s cabin amidships. The engine room has full headroom, with a work bench built over the 160 hp Cummins diesel engine, complete with drill press and an enviable array of tools. Aft of the engine is a separate cabin for the freezer, generator, and lots of storage. The boat stays warm with an oil-fired furnace and the galley&apos;s Olympus oil range. Griffin has the same beautiful canoe stern as Puffin, although at 58 feet she has the look and heft of a small freighter. This is exactly what she served as, too, carrying cargo between Puget Sound and the central B.C. coast. Griffin has become a familiar sight in Sidney over the past year, as owners Eric and Marj Bonner prepare for a European cruise via the Panama Canal. Eric spent 18 months searching for the right boat, in contact with brokerages around the world. Griffin was first launched from Philbrook&apos;s in 1971 as Ocean Girl, then Nisku, for her second owner who kept her for 26 years. Her round bottom hull is planked with 2- inch fir and draws seven feet; the engine, a single Caterpillar D-333 diesel, gives a cruising speed of 8.7 knots. With 2,000 gallons of fuel, Griffin&apos;s range is well over 4,000 miles. The equipment on Griffin is both classic and modern: single-lever Morse control (no gears), loading boom on the foredeck, lantern for an anchor light...along with a watermaker, two generators and NIAID stabilizers. Eric chose stabilizers over paravanes as they are better suited to the shallow waters of the Caribbean. They were installed last summer prior to going around Vancouver Island, and made all the difference in a heavy swell. Below decks, forward, is a newly refinished master cabin and head, with the utility room and guest staterooms aft. The raised wheelhouse gives excellent visibility over the bow, and the large, comfortable main saloon is sure to draw many visitors throughout the Bonner&apos;s trip. How satisfying it must have been for William Garden to share a chat and a cup of tea aboard these and the 30 other boats at the rendezvous. As special as this group of boats is, they represent but a fraction of his life&apos;s work. Will there be a third Garden Party? Organizer Nachtweih says yes; the site and the date will be announced soon. Anyone interested should mark their calendars, and plan on some very pleasant dock-walking next June.